Charles Ndifon’s testimony of healing 20 people in the terminally ill ward of a hospital is a tremendous testimony that God is healing all those who believe his Word. He testifies that we all encounter the healings that we have read about in the New Testament. Healing is simply by believing that what the bible says to be true. 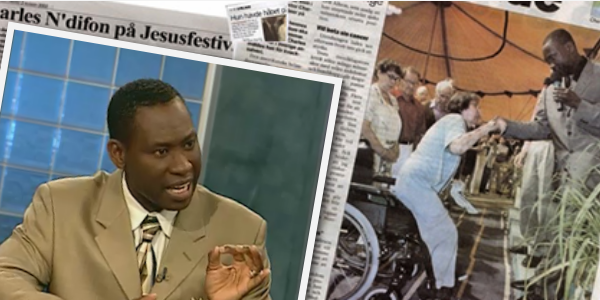 Why does Charles Ndifon have such success in seeing so many healings? Romans 10:17 tells us faith comes by hearing and hearing by the Word of God. When you listen to Charles Ndifon he simply believes and applies the word, and EXPECTS the miracle. He doesn’t waver in his faith wondering if God is going to produce the miracle. He simply believes, and God provides the miracle every time, because he applies Gods promises. We are told the only job we have in the whole process of healing which is just to believe, as God does all the hard work. Bree Keyton talks about how your mind, and belief can be such a powerful influence in healing. Bree Keyton saw first hand a woman who was paralyzed in one of her meetings, get up out of her wheelchair, and by the power of God was able to start walking around. Her expression and countenance was thrilling to see. She was was overjoyed that she was able to walk. What happened next changed her life. She turned to her husband, and her husband shook his head, and just wouldn’t accept she was healed. She took that unbelief, and sat back down on her wheel chair, and sadly rejected the healing and accepted the lie that she wasn’t healed. She could have walked out of that meeting healed, but she sat down into her wheelchair and embraced her husbands lack of faith. Memorizing healing scriptures is one way of internally consuming God’s promises for your life. And God has appointed these in the church: first apostles, second prophets, third teachers, after that miracles, then gifts of healings, helps, administrations, varieties of tongues. Are all apostles? Are all prophets? Are all teachers? Are all workers of miracles? Do all have gifts of healings? Do all speak with tongues? Do all interpret? But earnestly desire the best gifts. And yet I show you a more excellent way. Who Himself bore our sins in His own body on the tree, that we, having died to sins, might live for righteousness by whose stripes you were healed. And His name, through faith in His name, has made this man strong, whom you see and know. Yes, the faith which comes through Him has given him this perfect soundness in the presence of you all. “But I will restore you to health and heal your wounds,” declares the LORD. Healing is also tied to deliverance. Deliverance is simply by taking the authority that Jesus gives us in His name to free any demonic influences over our lives. Bree Keytons Stripes, Nails, Thorns and The Blood, is an excellent manual to deliverance and goes into great deal of explaining how we open the door to the power of darkness, and how the darkness often manifests itself through diseases. Simply by taking the authority in the name of Jesus, and commanding the demonic presence in your life to leave, you can have victory over diseases and infirmities. Then He called His twelve disciples together and gave them power and authority over all demons, and to cure diseases. He sent them to preach the kingdom of God and to heal the sick. so that they brought the sick out into the streets and laid them on beds and couches, that at least the shadow of Peter passing by might fall on some of them. Also a multitude gathered from the surrounding cities to Jerusalem, bringing sick people and those who were tormented by unclean spirits, and they were all healed. Now Peter and John went up together to the temple at the hour of prayer, the ninth hour. And a certain man lame from his mother’s womb was carried, whom they laid daily at the gate of the temple which is called Beautiful, to ask alms from those who entered the temple; who, seeing Peter and John about to go into the temple, asked for alms. And fixing his eyes on him, with John, Peter said, “Look at us.” So he gave them his attention, expecting to receive something from them. Then Peter said, “Silver and gold I do not have, but what I do have I give you: In the name of Jesus Christ of Nazareth, rise up and walk.” And he took him by the right hand and lifted him up, and immediately his feet and ankle bones received strength.So he, leaping up, stood and walked and entered the temple with themwalking, leaping, and praising God. And He said to them, “Go into all the world and preach the gospel to every creature. He who believes and is baptized will be saved; but he who does not believe will be condemned. And these signs will follow those who believe: In My name they will cast out demons; they will speak with new tongues; they will take up serpents; and if they drink anything deadly, it will by no means hurt them; they will lay hands on the sick, and they will recover.” So then, after the Lord had spoken to them, He was received up into heaven, and sat down at the right hand of God. And they went out and preached everywhere, the Lord working with them and confirming the word through the accompanying signs. Amen. Heal the sick, cleanse the lepers, raise the dead, cast out demons. Freely you have received, freely give. And He came down with them and stood on a level place with a crowd of His disciples and a great multitude of people from all Judea and Jerusalem, and from the seacoast of Tyre and Sidon, who came to hear Him and be healed of their diseases, as well as those who were tormented with unclean spirits. And they were healed. And the whole multitude sought to touch Him, for power went out from Him and healed them all. Is this not the carpenter, the Son of Mary, and brother of James, Joses, Judas, and Simon? And are not His sisters here with us?” So they were offended at Him. But Jesus said to them, “A prophet is not without honor except in his own country, among his own relatives, and in his own house.” Now He could do no mighty work there, except that He laid His hands on a few sick people and healed them. And He marveled because of their unbelief. Then He went about the villages in a circuit, teaching. So they were offended at Him. But Jesus said to them, “A prophet is not without honor except in his own country and in his own house.” Now He did not do many mighty works there because of their unbelief. Jesus went throughout Galilee, teaching in their synagogues, preaching the good news of the kingdom, and healing every disease and sickness among the people. And Jesus went about all Galilee, teaching in their synagogues, preaching the gospel of the kingdom, and healing all kinds of sickness and all kinds of disease among the people. Then His fame went throughout all Syria; and they brought to Him all sick people who were afflicted with various diseases and torments, and those who were demon-possessed, epileptics, and paralytics; and He healed them. Great multitudes followed Himfrom Galilee, and from Decapolis, Jerusalem, Judea, and beyond the Jordan. Then Jesus went about all the cities and villages, teaching in their synagogues, preaching the gospel of the kingdom, and healing every sickness and every disease among the people. Now a leper came to Him, imploring Him, kneeling down to Him and saying to Him, “If You are willing, You can make me clean.” Then Jesus, moved with compassion, stretched out His hand and touched him, and said to him, “I am willing; be cleansed.” As soon as He had spoken, immediately the leprosy left him, and he was cleansed. And He strictly warned him and sent him away at once, and said to him, “See that you say nothing to anyone; but go your way, show yourself to the priest, and offer for your cleansing those things which Moses commanded, as a testimony to them.” However, he went out and began to proclaim it freely, and to spread the matter, so that Jesus could no longer openly enter the city, but was outside in deserted places; and they came to Him from every direction. So He took the blind man by the hand and led him out of the town. And when He had spit on his eyes and put His hands on him, He asked him if he saw anything. And he looked up and said, “I see men like trees, walking.” Then He put His hands on his eyes again and made him look up. And he was restored and saw everyone clearly. Now He arose from the synagogue and entered Simon’s house. But Simon’s wife’s mother was sick with a high fever, and they made request of Him concerning her.When the sun was setting, all those who had any that were sick with various diseases brought them to Him; and He laid His hands on every one of them and healed them. Then as He entered a certain village, there met Him ten men who were lepers, who stood afar off. And they lifted up their voices and said, “Jesus, Master, have mercy on us!” So when He saw them, He said to them, “Go, show yourselves to the priests.” And so it was that as they went, they were cleansed. Next articleJoanie Stahl Reveals Her Powerful Keys To Spiritual Warfare, Prayer, & Miracles- You Don’t Want To Miss This!